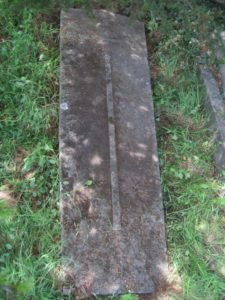 This coped stone, in the parish area of St Andrew the Great, is located on the first row to the left of the path, north of the centre circle, under the large cedar tree. CFHS were unable to read a name on the inscription but after their transcription of the grave register in 2017 we were able to identify this monument. William was the son of James and Isabella Fawcett. He was born in Leeds. Isabella was born in Cambridge. Emily was the daughter of Frederick and Mary Heycock. Mary was born in Cambridgeshire. Emily and William were both living at 3 Scroop Terrace, Cambridge when they died.